you and your team, but it often results in trash piling up in local landfills and slowly destroying the environment. This is where dumpster rental can help! As the top provider of dumpster rental to the Tampa Bay area, We Haul It is your go-to expert when it comes to properly disposing of things that you no longer want or need. We have been serving home and business owners since 1999, offering low prices, timely deliveries, and overall efficient and convenient service. All you have to do is call us for a quote for your job – be it removing old furniture, garage, shed and attic junk, construction debris or virtually anything else off your property. Depending on your needs, we will customize a dumpster rental that is fast and cost-efficient. No matter where, why or how you need to rent a dumpster, you can count on us! Furthermore, we care about keeping the world we live in green and clean, and we firmly believe in the saying that, “one person’s trash is another person’s treasure.” That is why we are proud to offer one of our most popular features – helping you donate your unwanted items to charity. We prevent the overfill of local landfills and help the less fortunate at the same time. Prices start at $150 for whatever your cleanup needs are. We also offer a $10 off coupon! We will drop off the dumpster at the beginning of the day and pick it up 48 hours later. You can request a shorter or longer period. If your cleanup is not complete, we can swap an empty dumpster for your full one. For your optimal convenience, we also do early morning and late-night drop-offs. Are you ready to experience the difference of our easy and affordable dumpster rental in the Tampa Bay area? If so, please do not hesitate to contact the We Haul It team by phone at 727-797-HAUL (4285), by email at contact@wehaulit.co, or through our convenient online form today. 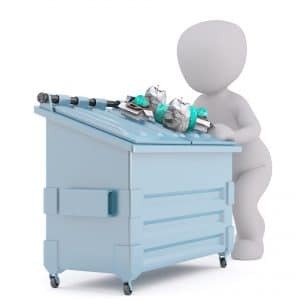 We look forward to helping you keep your home or commercial property free of useless junk!